What did I have? this fine old woman did say. I had four green fields**. Each one was a jewel. But strangers*** came and tried to take them from me. I had fine strong sons. They fought to save my jewels. They fought and died. And that is my grief, said she. Long time ago, said the fine old woman. A long time ago, this proud old woman did say. There was war and death. Plundering and pillage. My children starved. My mountains, valley and sea. And their wailing cries, they shook the very heavens. My four green fields ran red with their blood, said she. What have I now? said the fine old woman. What have I now? this proud old woman did say. In strangers’ hands, who tried to take it from me. But my sons have sons, as brave as were their fathers. My four green fields will bloom once again said she. Oh, my father was an Ulster man, good Protestant was he. They were married in two churches, lived happily enough. To be made a little Orangeman, me father’s shinin’ star. To my father, I was William, while my mother called me Pat. With Mother, every Sunday, to mass I’d proudly stroll. Then after that, the Orange lads would try to save my soul. I’d play the flute or play the harp, dependin’ where I was. Just as my father’s kinfolk were all sittin’ down to tea. And, me bein’ strictly neutral, I bashed everyone in sight. Oh it is the biggest mixup that you have ever seen. My father, he was Orange and me mother , she was Green. Now my parents never could agree about my type of school. My learnin’ was all done at home, that’s why I’m such a fool. Of the Orange and the Green. 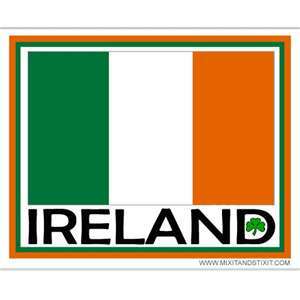 HAPPY ST. PATRICKS DAY TO ALL!! Great Mayo! Always loved the Orange and Green song. Spent st. Pat’s Day in Virginia visiting Dan and Heather. Thanks Mar! Hope Dan and Heather are doing well. I love it Mayo!!! A great combination…a little ballad and a little humor.